CodePink Attempts to “Arrest” Henry Kissinger for War Crimes in Vietnam, Laos, Chile and East Timor | Democracy Now! Activists from the antiwar group CodePink attempted to perform a citizen’s arrest on former Secretary of State Henry Kissinger when he testified on global security challenges at a Senate Armed Services Committee meeting on Thursday. Kissinger served as secretary of state and national security adviser during the Vietnam War under presidents Richard Nixon and Gerald Ford. Arizona Republican Sen. John McCain lashed out at the protesters and called on the Capitol Hill Police to remove them. AMY GOODMAN: Activists from the antiwar group CodePink attempted to perform a citizen’s arrest of former Secretary of State Henry Kissinger when he arrived Thursday to testify on global security challenges at a Senate Armed Services Committee meeting. Kissinger served as secretary of state and national security adviser during the Vietnam War under presidents Nixon and Ford. CODEPINK PROTESTERS: Arrest Henry Kissinger for war crimes! Arrest Henry Kissinger for war crimes! SEN. JOHN McCAIN: The committee will stand in recess until the Capitol police will restore order. 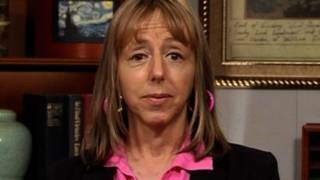 MEDEA BENJAMIN: In the name of the people of Chile, in the name of the people of Vietnam, in the name of the people of East Timor, in the name of people of Cambodia, in the name of the people of Laos. AMY GOODMAN: Senator John McCain lashed out at the protesters and called on the Capitol Hill Police to remove them. SEN. JOHN McCAIN: I’ve been a member of this committee for many years, and I have never seen anything as disgraceful and outrageous and despicable as the last demonstration that just took place about—you know, you’re going to have to shut up, or I’m going to have you arrested. … Get out of here, you low-life scum. AMY GOODMAN: Thirty minutes later, two more members of CodePink interrupted Henry Kissinger’s testimony before the Senate Armed Services Committee. HENRY KISSINGER: Yet if we look around the world, we encounter upheaval and conflict and chaos. ALLI McCRACKEN: CodePink calls for the arrest of Henry Kissinger for war crimes. Vietnam: From 1969 to 1973, Kissinger, working for Richard Nixon, oversaw the slaughter in Vietnam, Cambodia and Laos, which led to the deaths of millions—millions of people. Many thousands more died from the effects of massive doses of Agent Orange or from unexploded bombs that cover the countryside. ANNA KAMINSKI: Chile: Henry Kissinger was one of the principal architects of the coup in Chile on September 11th, 1973, a coup that overthrew the democratically elected government of Salvador Allende. SEN. JOHN McCAIN: Thank you. Thank you, Doctor. AMY GOODMAN: The CodePink protesters were taken out of the Senate hearing room, and Henry Kissinger continued with his testimony.